With the shimmering lakes and enchanting Northamptonshire countryside all around, Hellidon Lakes Hotel is a delightfully peaceful place to relax and enjoy some top quality golf. As the name suggests, water hazards play a huge part in the layout at Hellidon Lakes, making every hole exciting and challenging at the same time. Located in the heart of the Midlands, Hellidon Lakes can be easily reached from across the UK, while the majestic backdrop makes you feel a million miles away from real life. The Hellidon Lakes Hotel has everything you need on resort; lovely rooms, an extensive spa, awesome restaurant and even a bowling alley! The predominant feature is water, as the course's name suggests, with no fewer than 16 lakes placed strategically to attract wayward golf balls. The 220-acre landscape that is the backdrop to the golf course is in fact a nature reserve, and the wildlife and stunning panorama only serve to embellish the golfing experience. The course is fortunate to feature a cutting-edge irrigation system, designed to drain the greens effectively, ensuring that they roll true throughout the year. At its longest, the golf course at Hellidon Lakes will measure over 6,500, and will challenge the better players, while the different combinations and tee markers ensure that the resort is perfect for golfers of every standard. 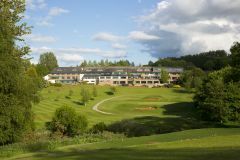 The hotel at Hellidon Lakes overlooks the same splendid natural landscape that is host to the golf course, with many rooms having particularly memorable panoramas. The hotel now has 110 excellent guest rooms, courtesy of an extensive development and refurbishment programme. The guest rooms and public areas are all extremely stylish, featuring excellent furnishings and fittings. For a special occasion, upgrade to one of the 4 exquisite suites, where you can enjoy the views over Northamptonshire and Warwickshire from the most luxurious setting. Visitors to Hellidon Lakes will be impressed with not only the accommodation, but also the extensive activities and excellent dining, making it a superb golf break package. Hellidon Lakes' Reflections Spa and Leisure centre is well equipped, offering guests the chance to take advantage of the indoor swimming pool, whirlpool spa bath, steam room, sun bed and extensive gymnasium. The more active can use the superb tennis courts, while the Spa itself has a range of health and beauty therapy, including specialist massages, facials and body treatments. The Lakes Brasserie provides a good selection of food together with an extensive wine list. The Terrace is ideal for bistro-style food or a refreshing drink. Hellidon Lakes has its very own 10-pin bowling alley. The hotel and course where good but there were a few things that could be improved upon. The room was very hot on check-in and continued to be throughout the stay. The rooms weren’t as nice as the last time we stayed. Hellidon Lakes is centrally located so not too far,very welcoming staff across all areas of the complex. The hotel is around 20 mins away from the motorway. All of our rooms were clean and tidy. They were all very hot though, so we slept with the windows open. Lovely views over the local countryside and the golf course. All the food we had in the evening was delicious, the only exception being the cheesecake. Breakfast was super, lots of choice and all decent quality. Staff were friendly throughout our stay. No complaints really, all we expected. Hotel was comfortable with very good facilities, the rooms allocated to golfers are in the old section and are a bit dated. The bar prices are way to high. Breakfast and dinner was a very good quality but but dinner portion sizes were to small. Course was in good condition but did have a few mats for tees which was a little surprising at the time of year we travelled. The course is very playable and favours the longer hitters. The 3 courses are not long but certainly make you think your way around. A couple more weeks of sunshine & growth it will be in top shape. A great 1 night DBB 2 Rounds package. The course was in very good condition considering the amount of rain there was leading up to the weekend. The greens were generally good. We played all three of the 9 hole courses and enjoyed Lakes & Valley the most. We would definitely come here again and I would recommend it to friends and family. Really nice flowing course. Good for people for shape the ball from right to left. The greens are a challenge but on some holes they could do with some extra attention. Course condition was poor with a lot of bare areas on the Fairways and portions of damaged greens. This may have been as a result of the dry summer. The actual course set up considering its short length is quite challenging and the driver is best left in the bag for most holes. The greens are definitely this courses defence mechanism with a lot of slopes and borrows to contend with but overall our group had reasonable scores and matches were tight.